Hermes does not need a lot of introduction as after the Birkin bag craziness this brand became well known to general public. Here are some small facts about the Hermes brand. It was founded as a saddlery shop in France in 1837. The logo features Duc carriage. Hermes has always used natural materials, such as silk and leathers and this created losses for company in the era of synthetic fibres. The Hermes family still has 80 of the company's stock. The Hermes brand sells 14 luxury fashion articles, such as men's and women's wear, watches, luxury leather and silk handbags, gloves, jewelry, home items and other. Hermes brand uses hand-craftsmanship for creating their coveted handbags. One craftsman makes one handbag, both for Hermes' men's handbag line and women's handbags. The leathers are carefully selected as this brand uses only the highest quality materials. It takes about 18 to 24 hours for one craftsman to complete the Hermes bag. The brand uses leathers of alligator, crocodile, oxen, deer, buffalo, goat, ostrich and other. Hermes men's leather bags have the highest quality and they are quite pricey too. 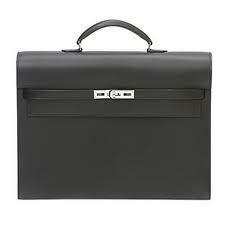 You can also take the Hermes men bag for a repair at Hermes shop. Hermes briefcases cannot be bought online and you have to go to the Hermes boutique. The online shop right now has the Hermes messenger bag for men in brown shade. This Hermes messenger bag can hold a laptop, so the it is quite versatile. It is called Steve messenger bag and the price is around 7000 USD. Arion is a great travel bag from Hermes and is made of canvas with leather trimmings. More Hermes briefcases and Hermes travel bags and Hermes man bags can be found in the brand's stores.